Chief Instructor of Goshin JuJitsu Association UK Wales. Sensei Davies continues Shihan Doak's progressive jujitsu methods by applying real life understanding gained during his 17 years of experience working in the security industry. Sensei Davies studied Goshin JuJitsu under the tutelage of the founder of the Goshin JuJitsu Association UK Wales, the late Shihan Billy Doak, 8th Dan JuJitsu, 4th Dan Judo and 3rd Dan Aikido. Shihan Doak was in turn, the only student to be instructed in jujitsu by the late Steadman Davies M.B.E., Sensei of the Sanshirokwai Judo, Aikido and Yoga club, Llanelli. Shihan Doak opened his first jujitsu club in Carmarthen, in 1992 and prior to his passing in 2009, instructed students in Carmarthen, Llanelli, Swansea, Neath and Port Talbot, on a weekly basis. He also instructed a number of students through affiliation to the Goshin JuJitsu Association, both in the U. K. and elsewhere in Europe. "Shihan Doak is, in my opinion, the most efficient exponent of jujitsu that I have ever seen"
Sensei Barry Davies continues to teach Goshin JuJitsu with the same traditions, standards and ethics instigated by Shihan Doak but using his unique teaching style and dynamic approach, to deliver classes to suit the knowledge, experience and abilities of the students. 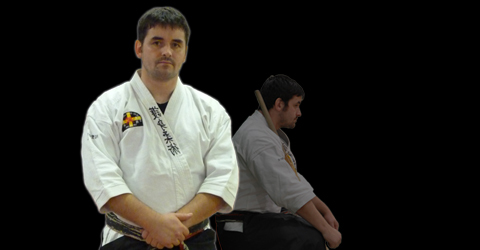 He encourages self-confidence and develops adaptive techniques to counter live situations, ensuring the future of the Goshin JuJitsu Association in South Wales. The development of human physiology has resulted in a natural aptitude for grappling that is ingrained to some extent in each of us. Effective unprotected striking can take months or even years of rigorous conditioning in order to minimize the damage to the striker. Jujitsu has been developed over hundreds of years and honed to maximize our natural aptitude for grappling in order to exploit the weak points of an opponent's body while re-directing his or her own force against them. Jujitsu has a vast number of techniques available giving practitioners a far greater scope to ' find what works for them ' than exists in other martial arts. JuJitsu (also known as Jiu Jitsu, Ju Jutsu and ju-jitsu) was developed as an unarmed combat, self-defence technique by the Samurai warriors of feudal Japan. Traditional jujitsu techniques place an emphasis on throwing (Nage Waza), immobilizing and pinning (Osaekomi waza), joint-locking (Kansetsu waza) and choking (Shime waza), to enable an unarmed Samurai warrior to defend against an armoured opponent in battle. JuJitsu is recognized as the parent martial art of Karate, Judo, Aikido and Sambo, as well as influencing many other fighting styles currently used in mixed martial arts competitions and sporting events worldwide. The Goshin JuJitsu Association UK Wales, places an emphasis on the traditional Japanese techniques while incorporating an array of modern skills introduced through the knowledge and experience of our founder Shihan Doak and our Chief Instructor Sensei Davies. Goshin JuJitsu provides you with the self-confidence to evaluate any situation and implement the appropriate measures to control the outcome. Shihan Doak stated that Goshin JuJitsu is, "The ultimate art for self-defence"
As a subscriber you'll get our monthly newsletter, with exclusive training features and latest jujitsu news. The Scottish Goshin Jitsu Academy are a small group of clubs teaching the ancient art of Ju-Jitsu. It is our intention as a non-political organisation to develop a greater appreciation of the art and to actively promote it as a means of self defence. The 1st BJJ club in Malta. We practise Brazilian Jiu-Jitsu, Submission Grappling & MMA. It is the first club in Malta specialising in Brazilian Jiu-Jitsu, where students can learn Jiu-Jitsu techniques for both self-defense and as a combat sport. Nishi Kaigan Goshin Ju-jitsu is a new martial arts club set up in Cardigan for people who would like to have the opportunity to learn a traditional form of Japanese self defence.